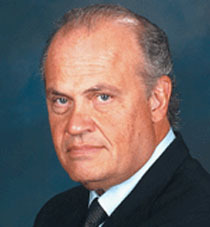 Fred Thompson is beginning to impress me. Yes, I know he's the most popular undeclared candidate in the upcoming 2008 Presidential race, at least on the Republican side. (Are there any popular undeclared Democrats? I haven't heard of any.) Yes, I know there are issues. And yet, I find myself liking him, as a candidate. I think he's playing it very smart -- being very up-front about himself (in re his recent revelations about his health, for example). I think it was wise of him to stay out of the fray at this early stage, while multiple candidates, Democrats and Republicans alike, batter each other senseless. (I did not understand why candidates felt it necessary to work so hard so early this time. Was there any reason for it, other than following Hillary's lead?) I'm also reminded of another recent dark-horse Presidential candidate, one who didn't announce his candidacy until relatively late in the process. True, Mr. Thompson's not getting the free press that the other candidates are getting. But it's not like the man lacks for name recognition -- he's been in two dozen movies and a great many TV episodes, in addition to his six-year term as Senator from Tennessee. And if that weren't enough, his day-job as occasional replacement for Paul Harvey, in addition, has given tens of millions of Americans daily access to his voice -- and his opinions, the kind of access any other candidate would kill for. It bothers Americans when we’re told how unpopular we are with the rest of the world. For some of us, at least, it gets our back up — and our natural tendency is to tell the French, for example, that we’d rather not hear from them until the day when they need us to bail them out again. In the meantime, let’s be realistic about the world we live in. Mexican leaders apparently have an economic policy based on exporting their own citizens, while complaining about U.S. immigration policies that are far less exclusionary than their own. The French jail perfectly nice people for politically incorrect comments, but scold us for holding terrorists at Guantanamo. President Vladimir Putin, though, shows no sign that he feels defensive about his remarkable string of luck. He knows who’s really to blame for "meddling" in Russian "internal affairs." It’s the United States. He’s lambasting us for yielding too much power. One example of this excessive power is the missile defense radar system we want to install in Poland and the Czech Republic — to give the free world early warning of a missile attack by terrorists or a rogue nation like Iran. Perhaps it’s just a coincidence that the Russians have been supplying Iran with both nuclear and missile technology while using their U.N. veto to block sanctions that would force Tehran to back down. Regardless, we’re clearly at fault, he says, for putting a defense system close to Mother Russia. Go check it out. And let's hope that we haven't seen the last of this guy. UPDATE: Instapundit helpfully links to this political biography of Fred Thompson. I found it a worthwhile read; you might want to have a look.